Bryan Ferry CBE (born 26 September 1945) is an English singer and songwriter. His baritone voice has been described as an "elegant, seductive croon". He also established a distinctive image and sartorial style; according to The Independent, Ferry and his contemporary David Bowie influenced a generation with both their music and their appearances. Peter York described Ferry as "an art object" who "should hang in the Tate". Ferry came to prominence as the lead vocalist and principal songwriter with the glam art rock band Roxy Music, achieving three no. 1 albums and 10 singles which reached the top 10 in the UK between 1972 and 1982. Their singles included "Virginia Plain", "Street Life", "Love is the Drug", "Dance Away", "Angel Eyes", "Over You", "Oh Yeah", "Jealous Guy", "Avalon", and "More Than This". Ferry began his solo career in 1973, while still a member of Roxy Music. His early solo hits include "A Hard Rain's a-Gonna Fall", "Let's Stick Together" and "This Is Tomorrow". Ferry disbanded Roxy Music following the release of their best-selling album Avalon in 1982 to concentrate on his solo career, releasing further singles such as "Slave to Love" and "Don't Stop the Dance" and the UK no. 1 album Boys and Girls in 1985. When his sales as a solo artist and as a member of Roxy Music are combined, Ferry has sold over 30 million albums worldwide. As well as being a prolific songwriter himself, Ferry has recorded many cover versions of other artists' songs, including standards from the Great American Songbook, in albums such as These Foolish Things (1973), Another Time, Another Place (1974), Let's Stick Together (1976) and As Time Goes By (1999), as well as Dylanesque (2007), an album of Bob Dylan covers. In 2019, Ferry will be inducted into the Rock and Roll Hall of Fame as a member of Roxy Music. Ferry was born in Washington, County Durham, into a working-class family (his father, Fred Ferry, was a farm labourer who also looked after pit ponies), and attended Washington Grammar-Technical School (now called Washington School) on Spout Lane from 1957. As a child he had a job as a paperboy. He studied fine art at the University of Newcastle upon Tyne from 1964 until 1968, under Richard Hamilton for one year. His contemporaries included Tim Head and Nick de Ville. During this period, Ferry was a member of the bands The Banshees, City Blues, and The Gas Board, the latter of which featured Graham Simpson and John Porter. He then moved to London in 1968 and taught art and pottery at a school in Olympia, while pursuing a career in music. Ferry formed Roxy Music with a group of friends and acquaintances, beginning with Graham Simpson, in November 1970. The line-up was expanded to include saxophonist/oboist Andy Mackay and Brian Eno, an acquaintance who owned tape recorders and played Mackay's synthesiser. Other early members included timpanist Dexter Lloyd and ex-Nice guitarist David O'List, who were replaced respectively by Paul Thompson and Phil Manzanera before the band recorded its first album (early Peel Sessions for the UK's BBC Radio 1 feature O'List's playing). 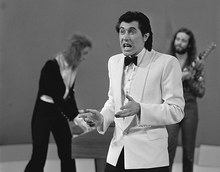 Roxy Music's first hit "Virginia Plain" made the UK top 5 in 1972, and was followed up with several hit singles and albums, with Ferry as their lead vocalist and instrumentalist (he taught himself the piano in his mid-twenties) and Eno contributing synthesiser backing. After their second album, Brian Eno left Roxy Music, leaving Ferry its undisputed leader. Ferry started a parallel solo career in 1973, initially performing cover versions of old standards on albums such as These Foolish Things (1973) and Another Time, Another Place (1974), both of which reached the UK top 5. After the concert tour in support of their fifth studio album Siren, Roxy Music temporarily disbanded in 1976, though band members Paul Thompson, Phil Manzanera and Eddie Jobson took part in recording Ferry's subsequent solo material. That year Ferry covered the Beatles' "She's Leaving Home" for the transitory musical documentary All This and World War II. He released three solo albums during this period, Let's Stick Together (1976), In Your Mind (1977) and The Bride Stripped Bare (1978). All three albums reached the UK top 20. Roxy Music reformed at the end of 1978 to record tracks for their sixth studio album Manifesto, which was released in early 1979 and reached no. 7 in the UK album charts, with Ferry, Manzanera, Thompson and Mackay. The follow-up was 1980's Flesh + Blood, which reached no. 1 in the UK album charts, two years before the group's final studio release Avalon in 1982, which also reached no. 1 in the UK album charts. The band also achieved their first and only UK no. 1 single, "Jealous Guy", released in 1981 as a posthumous tribute to its author John Lennon, who had been murdered two months earlier. It was the only one of their singles not to be written or co-written by Ferry. After lengthy tours to promote the Avalon album, Ferry decided to disband Roxy Music in 1983 and continue as a solo artist. Ferry continued to record as a solo artist, and released Boys and Girls, his sixth solo album, in 1985. The album reached no. 1 in the UK, his first and only solo recording to do so, and also became his biggest selling album in the US. In July 1985, Ferry performed at the London Live Aid show, accompanied by Pink Floyd guitarist David Gilmour. As with other successful Live Aid acts, his then current album Boys and Girls remained in the UK chart for almost a year. After the Avalon promotional tours, Ferry was rather reluctant to return to live touring on the road; however, a change of management persuaded him to resume touring in 1988 to promote the previous year's Bête Noire. Following the tour, Ferry teamed again with Brian Eno for Mamouna (collaborating with Robin Trower on guitar and as producer). The album took more than five years to produce, and was created under the working title Horoscope. During production, Ferry simultaneously recorded and released Taxi in 1993, which proved to be a greater commercial and critical success than Mamouna when it was finally released in 1994. In 1996, Ferry performed the song "Dance with Life" for the Phenomenon soundtrack, written by Bernie Taupin and Martin Page. In 1999, Ferry released As Time Goes By, an album of 1930s songs, which was nominated for a Grammy Award. Ferry, Manzanera, Mackay and Thompson re-reformed Roxy Music in 2001 and toured extensively for a couple of years, though the band did not record any new material. In 2002, with the help of Manzanera and Thompson, Ferry returned with his next studio album Frantic, which featured several tracks written with David A. Stewart as well as a collaboration with Brian Eno. The album was a mix of new original material and covers – something that Ferry had not attempted on a solo album since The Bride Stripped Bare in 1978. In 2003 Ferry provided the entertainment for the Miss World contest. In 2004, he starred in the short film The Porter. In 2005, it was confirmed that Roxy Music (Ferry, Mackay, Manzanera and Thompson) would perform shows at that year's Isle of Wight festival and that they would record an album of new and original songs, with no indication of when such a project would reach completion. Brian Eno confirmed that he had worked in the studio with Roxy Music once more and had co-written songs for the new album. However, Ferry later stated that some of the material from these sessions would most likely be released as part of his next solo album, and that "I don't think we'll record as Roxy again." In October 2006, Ferry signed a contract with the British retailer Marks & Spencer to model its "Autograph" men's clothing range. In March 2007, Ferry released the album Dylanesque, an album of Bob Dylan songs with backing vocals from Tara McDonald and Anna McDonald. The album charted in the UK top 10, and Ferry undertook a UK tour. On 7 October 2008, Ferry was honoured as a BMI Icon at the annual BMI London Awards. In 2009, Ferry provided vocals on DJ Hell's record U Can Dance. The original version of the track was recorded for Ferry's new studio album Olympia, released in October 2010. The album included some of the material he recorded with his former Roxy Music band members, and featured musicians such as Nile Rodgers, David A. Stewart, Scissor Sisters, Groove Armada, Michael "Flea" Balzary, Jonny Greenwood and David Gilmour. The model Kate Moss was featured on the album cover. Ferry also provided vocals for the song "Shameless" on Groove Armada's 2010 album Black Light. The album received a nomination for the 53rd Grammy Awards in the category Best Electronic/Dance Album. In 2011 Roxy Music performed together for the last time to date as Ferry, Phil Manzanera and Andy Mackay embarked on a world tour to celebrate the group's 40th anniversary. In June 2011, Ferry was made a CBE in the Queen's Birthday Honours for his contribution to the British music industry, and in 2012 he was awarded the French national honour of Officier de l’ordre des Arts et des Lettres. In 2014, Ferry was made an honorary Doctor of Music by Newcastle University. On 26 November 2012, he released a new album entitled The Jazz Age with the Bryan Ferry Orchestra. The album features 1920s period jazz renditions of some of Ferry's songs (from both his solo discography and with Roxy Music). Film director Baz Luhrmann asked to use Ferry's song "Love Is the Drug" from The Jazz Age album for the 2013 film The Great Gatsby. This resulted in a collaboration with The Bryan Ferry Orchestra to create several jazz pieces throughout the movie, released as a separate album titled The Great Gatsby – The Jazz Recordings (A Selection of Yellow Cocktail Music). Ferry began touring with The Bryan Ferry Orchestra in 2013, including a performance at the 2013 Cannes Film Festival which was opened by Luhrmann's Great Gatsby film. In 2014, Ferry toured extensively, with notable performances including Coachella Valley Music and Arts Festival, as well as an appearance at the Chicago Theatre which was preceded by a talk with author Michael Bracewell at the Museum of Contemporary Art on the subjects of fame and his creative inspiration. Also in 2014, Ferry collaborated with the Norwegian DJ/producer Todd Terje, providing vocals on a cover version of "Johnny and Mary" (originally recorded by Robert Palmer). The track was released as a single and appeared on Terje's album It's Album Time. In June 2014, Ferry appeared at the 2014 Glastonbury Festival, and in 2015 Ferry returned to Coachella to perform as a guest artist with Terje. While furthering his solo career in recent years, Ferry has continued to collaborate with previous members of Roxy Music, including backing singer Fonzi Thornton and guitarist Neil Hubbard. Both Thornton and Hubbard toured with Ferry extensively during his promotion of the Avonmore album in 2015 and 2016. In February 2018, a 45th anniversary deluxe edition of Roxy Music's eponymous debut album was released, including numerous demos, outtakes, and unseen photographs curated over the years by Ferry. During his promotional tour to support the deluxe re-issue, Ferry said he was open to collaborating once again with Roxy Music keyboardist Brian Eno. In addition to his contributions to music, Ferry has also come to be known for his distinctive style and artistic sensibilities. In 2005, GQ presented Ferry with its Lifetime Achievement Award, deeming him "pop's original art-school bobby-dazzler" and noting his solo career spent as the "world's best-dressed and most languidly mannered deluxe chanteur". Esquire has noted Ferry's lifelong obsession with clothing and describing any in-person interaction with him as a "bespoke event, a louche ensemble of elegant affectations". In his 1976 essay 'Them', Cultural critic Peter York described Ferry as "the best possible example of the ultimate art-directed existence" and suggested he was the most important pasticheur in Britain at the time. Ferry has credited numerous art and film influences throughout his career, among them Richard Hamilton, Marcel Duchamp, and Humphrey Bogart. Hamilton is credited by Ferry as an inspiration to him both as an artist and as a person, and is also responsible for introducing Ferry as an art student to Duchamp's work. The title of Ferry's 1978 solo album The Bride Stripped Bare is taken from Duchamp's classic work The Bride Stripped Bare by Her Bachelors, Even. For Bogart, Ferry penned the song "2HB" ("2HB" = "To Humphrey Bogart"), leading the band Madness to record "4BF" ("for Bryan Ferry"), on their 1988 album The Madness. Phil Manzanera, who would become Roxy Music's guitarist, recalls Ferry discussing Humphrey Bogart and other classic golden age Hollywood films during his audition to join the band. Several of the women Ferry had been involved with have appeared as cover models on the Roxy Music albums. In 1975, Ferry began a relationship with model Jerry Hall, having first met when she appeared on the album cover for Siren, which was photographed in Wales during the summer of 1975. According to Harper's Bazaar, the photoshoot boosted Hall's status as an international celebrity. Her stay at Ferry's Holland Park (London) home, following the album cover photo shoot, marked the start of their affair. Hall and Ferry lived together, sharing homes in London and in the Bel Air district of Los Angeles, and Hall also appeared in some of Ferry's solo music videos, including "Let's Stick Together" and "The Price of Love" (both 1976). Their relationship ended when she left him for Mick Jagger in late 1977. Ferry rarely talks about Jerry Hall, but fans have often speculated that his song "Kiss and Tell" from his album Bête Noire (1987) was Ferry's response to Hall's tell-all book about their relationship published a couple of years earlier. Additionally, Ferry's 1978 solo album The Bride Stripped Bare is widely believed to contain allusions to his break-up with Hall—particularly the song "When She Walks in the Room". On 26 June 1982, Ferry married London socialite Lucy Helmore, who had become pregnant with their child Otis (b. 1 November 1982). Although her face is not seen, Helmore was the model on the front cover of Roxy Music's album Avalon (1982), released a month before their wedding. The couple had three more sons, Isaac, Tara, and Merlin. After 21 years of marriage the couple divorced in 2003. Helmore died in 2018 at the age of 58. In 2000, the whole Ferry family were on British Airways Flight 2069 to Nairobi when a deranged passenger forced his way into the cockpit, attacked the pilot and caused the plane to lurch downward. A crash was prevented when the assailant eventually was overcome. The pilot was given a bravery award for recovering from a descent 12,000 feet in 25 seconds – the fastest rate of descent any civil aircraft has ever recovered from. Ferry's son Otis has become known in the British media for his pro-hunting political activities. He has been arrested and charged several times for activities relating to hunting, only one of which led to a conviction. In 2004, Otis was among pro-hunt campaigners who stormed into the chambers of the House of Commons during a debate on the banning of hunting. He was charged with disorderly conduct. Otis was also a joint master of the South Shropshire hunt. By 2008, Ferry's son Tara was performing in a rock band called Rubber Kiss Goodbye. By 2008, Merlin was studying for "A" Levels at Marlborough College, and then played guitar in a band called Voltorb. Ferry's children have also contributed to his albums Olympia and Avonmore. On Olympia, Tara played drums on several tracks, Merlin played guitar on one track, and Isaac was the producer of the album's artwork. Tara also toured with Ferry (and Roxy Music) on the band's 2011 For Your Pleasure tour, performing additional drums. Ferry and Helmore split in the early 2000s following an affair she had, and they divorced in 2003. After their separation, British newspapers photographed Ferry with Katie Turner, 35 years his junior, naming her as his new girlfriend. Ferry and Turner met while she worked as one of the dancers on Roxy Music's concert tour in 2001 (and is featured on the DVD of the 2001 Hammersmith Odeon Show). She appeared with Ferry on several TV shows to promote the Frantic album, and performed on the Frantic tour in 2002. After their break-up, Ferry had a relationship with British socialite Lady Emily Compton. In 2006 he resumed his relationship with Katie Turner for some time. Ferry began a relationship with Amanda Sheppard, an acquaintance of one of his sons. Sheppard worked in public relations. In early January 2012, Ferry married Sheppard in a private ceremony on the Turks and Caicos Islands. In August 2013, it was reported that the couple were to separate after 19 months of marriage. Ferry was estimated to have a fortune of £30 million in the Sunday Times Rich List of 2010. In 2007, Ferry praised the imagery and iconography of Nazi Germany in an interview with the German newspaper Welt am Sonntag, citing in particular "Leni Riefenstahl's movies and Albert Speer's buildings and the mass parades and the flags". Ferry later issued a public apology for any offence caused by the comments. Jewish Labour peer Greville Janner criticised Ferry for his remarks. I would support a Cameron government. I have met him, and he's a bright guy. I hope they do well. I don't like the way the present Government has done things, most of all putting my son in prison for four and a half months, totally unlawfully ... and that's not just my opinion: judges, all sorts, have said it was a stitch-up. It was politically motivated. The poor lad just wants to live the traditional country life. Ferry is a supporter of the Countryside Alliance and has played concerts to raise funds for the organisation. In August 2014, Ferry was one of 200 public figures who were signatories to a letter to The Guardian expressing their hope that Scotland would vote to remain part of the United Kingdom in September's referendum on that issue. As an actor, Ferry has appeared in Neil Jordan's 2005 film Breakfast on Pluto as the character Mr. Silky String, as himself in the fourth episode of the French television mini-series Petit déjeuner compris in 1980, and most recently as a cabaret singer in the 2017 television series Babylon Berlin. In addition, Ferry contributed six songs to the latter series and its soundtrack, including "Dance Away" from the 1979 album Manifesto, and Bitter-Sweet, with its original German verses. ^ a b c Hoskyns, Barney (16 June 2001). "Bryan Ferry: Melancholic of Glam". The Independent. London. Retrieved 17 November 2014. ^ Erlewine, Stephen Thomas. "Avalon". AllMusic. Retrieved 2 June 2015. ^ "David Bowie and Bryan Ferry have inspired a Seventies fashion revival this spring". The Independent. 16 May 2015. Retrieved 2 June 2015. ^ a b Bracewell, Michael (7 June 2012). "Roxy Music and Art-Rock Glamour: Faber Forty-Fives: 1969–1972". Faber & Faber. Retrieved 2 December 2018 – via Google Books. ^ "Bryan Ferry Signs Worldwide Partnership Deal with BMG Chrysalis U.K." The Hollywood Reporter. 31 October 2012. Retrieved 17 November 2016. ^ Gittins, Ian (2 March 2007). "Bryan Ferry, Dylanesque". The Guardian. Retrieved 19 September 2018. ^ "Roxy Music". Rock and Roll Hall of Fame. 2019. Retrieved 13 December 2018. ^ "Bryan Ferry's solo work". Vivaroxymusic.com. Retrieved 10 August 2007. ^ "Wearside Echoes: Bryan before Roxy Music". Sunderlandecho.com. Retrieved 9 July 2017. ^ Savage, Jon (1 February 2018). "Bryan Ferry on how Roxy Music invented a new kind of pop: 'We were game for anything'". Theguardian.com. Retrieved 2 December 2018 – via www.theguardian.com. ^ "Richard Hamilton Biographical chronology". Infoloop.org. Archived from the original on 1 July 2007. Retrieved 15 June 2007. ^ Hodgkinson, Will (18 March 2007). "Soundtrack of my life: Bryan Ferry". The Observer. London. Retrieved 15 June 2007. ^ "The best of both worlds?". Interview. Arena Magazine. September 1994. Retrieved 15 June 2007. ^ "Look Back in Languor". The Guardian. 14 June 1997. Archived from the original on 25 June 2007. Retrieved 15 June 2007. ^ "John Porter: Interview". Soundonsound.com. Retrieved 17 November 2014. ^ "Bryan Ferry – History". Bryanferry.com. Retrieved 26 August 2014. ^ "Bryan Ferry". Vivaroxymusic.com. Archived from the original on 7 June 2007. Retrieved 15 June 2007. ^ "Getting Roxy Music in with 'The 'In' Crowd' – An Interview With Davy O'List". VivaRoxyMusic.com. 25 April 2004. Archived from the original on 15 May 2007. Retrieved 15 June 2007. ^ "Bryan Ferry & Roxy Music UK chart statistics". Roxyrama.com. ^ "Live Aid (13 July 1985): Bryan Ferry". MTV. January 2002. Retrieved 15 June 2007. ^ "Diversity marks Grammy nominations". CNN. 3 January 2001. Retrieved 30 November 2007. ^ "Irish Eyes Are Smiling". Sky News. 2 December 2003. Retrieved 30 November 2007. ^ "Roxy Music To Play at the Isle of Wight Festival". 17 March 2005. Retrieved 17 April 2007. ^ "Roxy back in the studio". Phil Manzarena. 30 June 2005. Archived from the original on 17 March 2007. Retrieved 17 April 2007. ^ "Working with someone is like dating". The Guardian. London. 19 May 2006. Retrieved 17 April 2007. ^ Sanghera, Sathnam (28 November 2009). "Bryan Ferry I lead quite a sheltered life". The Times. London. Retrieved 22 May 2010. ^ Thrills, Adrian (26 November 2009). "'People think I wake up in the morning and put on a tuxedo': Bryan Ferry reveals the truth about his life and career". Daily Mail. London. ^ "Bryan Ferry Receives Icon Honours at BMI London Awards". Bmi.com. Retrieved 15 September 2010. ^ "Groove Armada Black Light Review". BBC. 2010. Retrieved 18 August 2018. ^ "Groove Armada". Grammy.com. 22 May 2018. Retrieved 2 December 2018. ^ "Bruce Forsyth knighthood heads Queen's Birthday Honours". BBC News. 11 June 2011. ^ "Roxy Music's Bryan Ferry receives honorary degree from Newcastle University". Express.co.uk. 12 July 2014. Retrieved 2 December 2018. ^ "MCA Talk: Bryan Ferry and Michael Bracewell". MCA. Retrieved 18 August 2018. ^ "New Bryan Ferry Live Album – Bryan Ferry". Bryanferry.com. Retrieved 2 December 2018. ^ "Concert Review: Bryan Ferry With the Hollywood Bowl Orchestra". Variety. Retrieved 18 August 2018. ^ "Lefsetz Letter » Blog Archive » Bryan Ferry At The Hollywood Bowl". Lefsetz.com. Retrieved 2 December 2018. ^ "Bryan Ferry trifft Tim Bendzko". Night of the Proms. Retrieved 18 August 2018. ^ "Bryan Ferry on how Roxy Music invented art pop: 'We were game for anything'". The Guardian. 1 February 2018. Retrieved 18 August 2018. ^ "Bryan Ferry eyes reunion with Brian Eno: "I'd like to do some more stuff with him again"". Consequenceofsound.net. 8 February 2018. Retrieved 2 December 2018. ^ Mills, Simon. "2005: Bryan Ferry". Gq-agazine.co.uk. Retrieved 2 December 2018. ^ "Brian Ferry: Style Icon". Esquire.com. 8 January 2016. Retrieved 2 December 2018. ^ "Ferry leads tributes to Hamilton". Bbc.com. 14 September 2011. Retrieved 2 December 2018. ^ "Roxy Music: Deconstructing Rock's First Postmodern Masterpiece". Udiscovermusic.com. Retrieved 2 December 2018. ^ "Jerry Hall Interview". Harper' Bazaar. Retrieved 18 August 2018. ^ "The Many Romances of Jerry Hall". Town and Country Magazine. Retrieved 18 August 2018. ^ "Bryan Ferry: "People like you to be difficult and weird"". Uncut Magazine. Retrieved 18 August 2018. ^ "Songfacts: Kiss And Tell by Bryan Ferry". Songfacts. Retrieved 10 August 2007. ^ Stephanie R. Myers. "Jerry Hall Prefers Rockers Over Brad Pitt". Softpedia. Retrieved 10 August 2007. ^ a b c d e "Faces of the Week". BBC News. 24 September 2004. Retrieved 17 November 2014. ^ "Isaac Ferry". Tatler. Retrieved 17 November 2014. ^ "Bryan Ferry Speaks Out After Ex-Wife's Sudden Death". NME. 25 July 2018. Retrieved 26 July 2018. ^ Khan, Jemima (2 December 2018). "'Three seconds longer and we'd have crashed'". Telegraph.co.uk. Retrieved 2 December 2018. ^ "Rock Star's son convicted over Commons protest". The Daily Telegraph. London. 26 May 2005. Retrieved 28 December 2010. ^ Roberts, Alison (26 December 2004). "Otis Ferry: Leader of the pack". The Independent. London. Retrieved 16 December 2014. ^ Alderston, Andrew (30 May 2009). "Otis Ferry: 'They put me in jail for my beliefs'". The Daily Telegraph. London. Retrieved 21 October 2014. ^ a b "The Times & The Sunday Times". Timesonline.co.uk. Retrieved 9 July 2017. ^ "Tara Ferry keeps dad Bryan Ferry on song". Daily Express. London. 2 February 2011. Retrieved 17 November 2014. ^ "Melting moment for King of Cool". Evening Post. 11 October 2002. Archived from the original on 30 September 2007. Retrieved 15 June 2007. "Frantic Tour". Boston Globe. 10 November 2002. Archived from the original on 30 September 2007. Retrieved 15 June 2007. "Bryan Ferry surrenders the depths of his soul". Boston Globe. 13 November 2002. Archived from the original on 30 September 2007. Retrieved 15 June 2007. "Bryan Ferry at The Chicago Theatre". Chicago Sun Times. 21 November 2002. Archived from the original on 30 September 2007. Retrieved 15 June 2007. ^ "Bryan Ferry: Back in style". The Independent. 12 August 2006. Archived from the original on 30 September 2007. Retrieved 15 June 2007. ^ "Love boat: Bryan Ferry sails across Med with younger girlfriend". Daily Mail. London. 14 August 2010. Retrieved 20 September 2010. ^ Bull, Sarah (11 January 2012). "Bryan Ferry, 66, marries Amanda Sheppard, 29, in romantic island ceremony". Daily Mail. London. ^ Sawer, Patrick (31 August 2013). "What's her name? Roxy Music's Bryan Ferry splits from wife after 19 months". The Daily Telegraph. London. ^ "Musicians coining it in Sunday Times Rich List". Iptegrity.com. Retrieved 17 November 2014. ^ Beckford, Martin (17 April 2007). "Bryan Ferry apologises for Nazi comments". The Daily Telegraph. Retrieved 19 September 2018. ^ "Bryan Ferry dropped by Marks & Spencer". NME. 14 May 2007. Retrieved 19 September 2018. ^ Farndale, Nigel (16 April 2008). "Bryan Ferry: 'I don't want to be controversial'". The Daily Telegraph. London. Retrieved 16 May 2009. ^ Sanghera, Sathnam (28 November 2009). "Bryan Ferry: 'I lead quite a sheltered life'". The Times. London. Retrieved 27 April 2010. ^ "Bryan Ferry to play Countryside Alliance Benefit Concert". Roxyrama.com. Retrieved 17 November 2014. ^ "Is Your Love Strong Enough (Long Version)". Soundcloud.com. Retrieved 2 December 2018. ^ "TANGERINE DREAM - Legend (OST) (1986)". Progarchives.com. Retrieved 2 December 2018. ^ "DRAGON TATTOO – Bryan Ferry". Bryanferry.com. Retrieved 9 July 2017. ^ Bryan, Miranda (27 June 2010). "Noel Fielding's life of Bryan". The Guardian. Retrieved 11 September 2018. ^ Bryan Ferry dans "Petit Déjeuner Compris" Part 1. 16 May 2011. Retrieved 29 November 2015. Wikimedia Commons has media related to Bryan Ferry.